Given the theme for this week, I was tempted by a number of past photographs, and once I decided to use a photo from the week, I have managed to narrow it down to this one. This week, I am happy as Tom & Seb have been so excited about starting 'big boy school'. They will do five afternoons a week, so once lunch was over yesterday there was so much excitement as they were able to put their uniforms on for real. And we gathered outside for my mandatory first day photos. And this happened as we got into the car. I am blessed with children who are so excited, that they do not seem to need a comfort mattress. 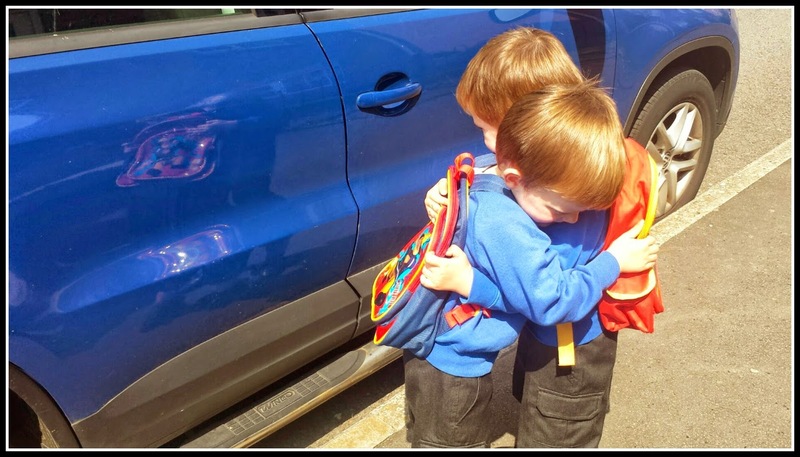 Who bound into school, with mummy begging for a 'goodbye'. And now, I get the benefit of knowing that; as they decided to go their separate ways as they explored their new surroundings, they will always know where a hug is waiting. What a wonderful photograph, you must be so proud of them! Hope it all continues to go well for them! Oh my goodness that photo is just too cute for words! What a lovely photograph, it really does help you and them if they're happy going to school. A heart melting moment! Just gorgeous. It is such a blessing when they scamper into school all excited - mine have always been happy to go - but a 'goodbye' would be nice sometimes! Oh my goodness, this is so cute! I bet you were thrilled you managed to catch it on camera. Good luck boys! That's lovely, they are so sweet. Hope they enjoy big school! Wonderful. I love seeing moments between siblings like that. I hope school lived up to their expectations.